Home DIY home decor ideas Custom Wall Art for Less! After completing the feature wall behind my dresser in my bedroom using a lovely Moroccan Stencil, I felt like the large wall behind my bed was so blank and boring in comparison. I really just wanted to find a nice way to add some fun and color to my blank wall while complimenting my stenciled feature wall, so I thought it would be perfect to do some stenciled canvas art. All of the art I saw in stores was either too expensive or didn’t go with my space at all, most of the time it was both! Using Cutting Edge Stencils, I was able to customize my colors and patterns to match my personal style and space perfectly and I didn’t have to pay fine art prices. I had this vision of combining geometric stencils as the background with a very organic and free flowing large flower stencil as the foreground. 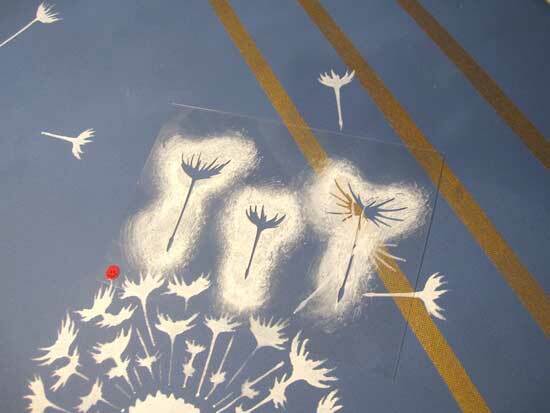 The dandelion stencil was perfect! My wall is so big, I felt like a triptych would be ideal; plus I just love the look of having three different, separated canvases that are all connected by the art on them. I’ve seen the multiple canvas look all over the blog and design world and just love it! 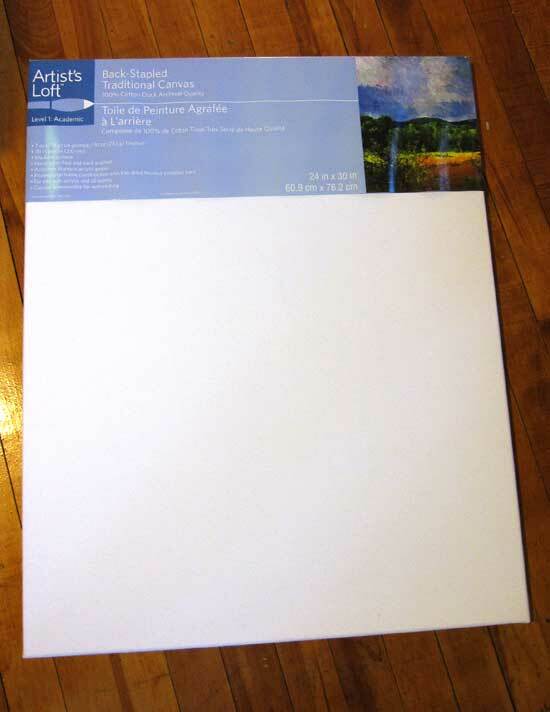 I found a great deal on canvases at Michaels. They are often on sale and I got mine 40% off so each one was only $12. 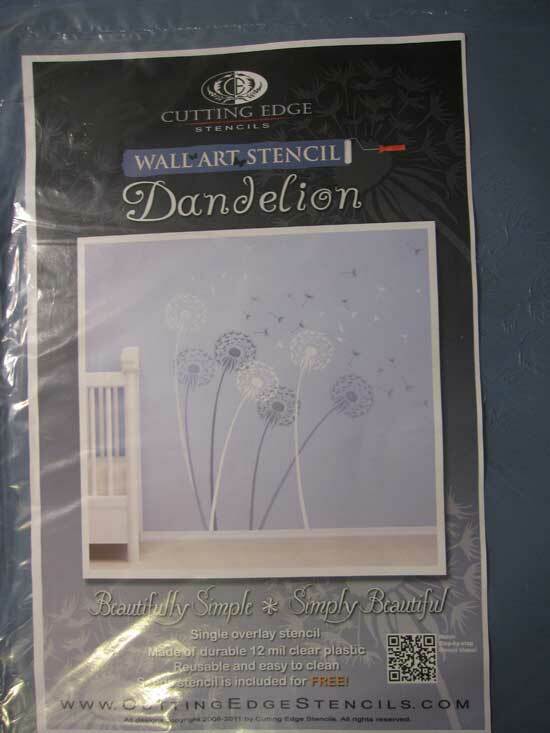 What’s is great about these canvases and Cutting Edge Stencils, is that they are both reusable, so if I end up moving and want to go for new look, I can always paint over my wall art canvases with some new stencils. That to me is one of the great aspects of using a stencil as opposed to a wall decal, you can re-use it and beautify one space after another. It really makes me see even more the value of my stencils. I decided to paint two of the three canvases with FolkArt Pure Gold and the other FolkArt Sterling Blue (the same color I used to stencil my feature wall). As you can see, I placed an old sheet on the floor to protect them from paint (not the most aesthetically pleasing background, but definitely needed!) 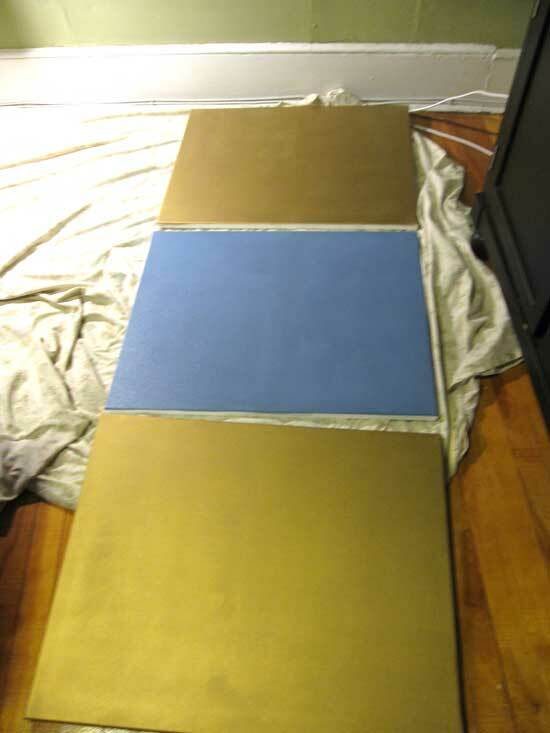 So that I didn’t have to apply multiple coats of the gold and blue, I took some leftover Mushroom FolkArt Acrylic paint and used the 4″ Dense Foam Roller to base coat all three canvases with it. 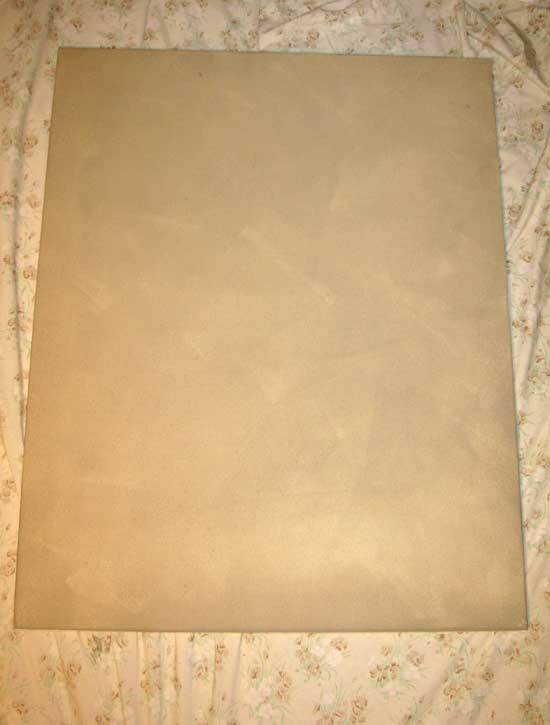 If you are painting a dark color or gold on a white canvas, it is always a good idea to base the white out with a midway color, like the Mushroom I used, so that you don’t end up having to apply 4 coats of gold paint. 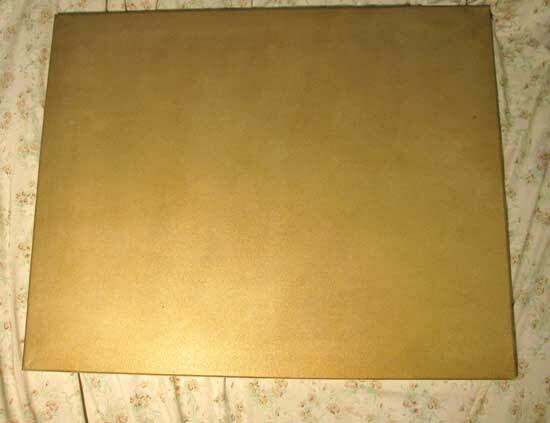 This is how the canvas turned out after I rolled about 1 and a 1/2 coats of gold. 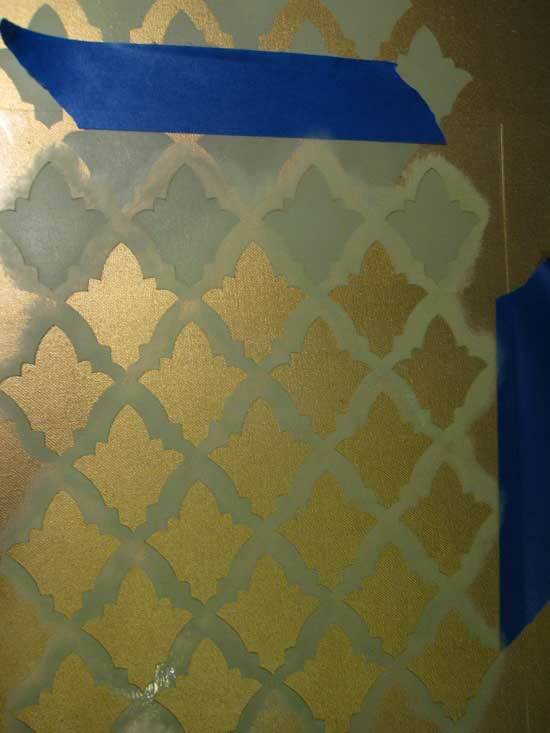 I have a gold Mirror on the feature wall I stenciled with the oasis allover moroccan stencil, and all the hardware in my room is gold, so I wanted to incorporate gold into my stenciled wall art to tie all the gold throughout my room together. After using the dense foam roller to paint all three canvases, I layed them out to see the effect of having the blue in the middle. Just what I wanted! 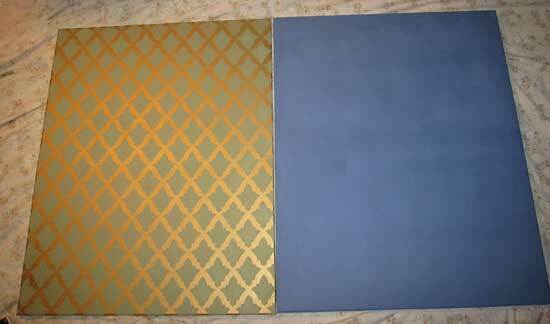 Gold to match my feature wall mirror, and blue to match the feature wall Oasis stencil. 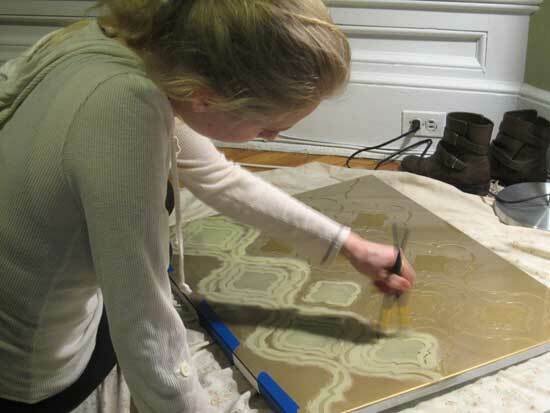 I decided to use the Craft sized Tulip Stencil on one of the gold painted canvases. Because I was working on a smaller scale, I used the 5/8″ Stencil Brush and Basil Green FolkArt Acrylic paint to match my room wall color. 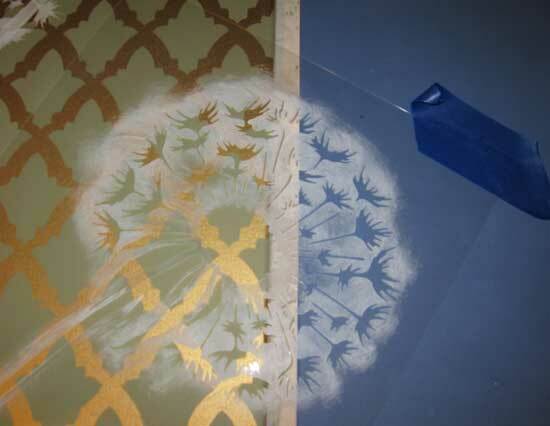 For more detailed instructions on how to use an allover stencil, please check out our How-to Stencil video. As you can see in this photo, I easily aligned the first row of my second application, with the last row of my first application. Easy as pie! I loved the way it was progressing with the addition of the craft sized Tulip Allover stencil. Time to move on to the other gold canvas! I decided to go with a larger design for the second gold canvas to mix up the scale a bit. I went with the Moroc-n-Roll Allover Stencil which is just such a cool design and fit perfectly with my theme. For more detailed instructions on how to use a stencil brush we have a wonderful stencil video which is short and very helpful. 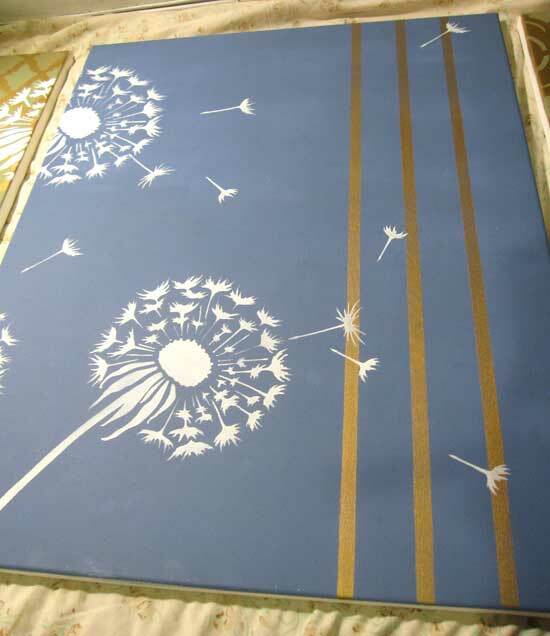 After stenciling the Tulip Allover Stencil and the Moroc-n-Roll on the two gold canvases, I decided to incorporate the Dandelion Medium and Large stencils to tie all three canvases together. I think having something organic going over the very geometric background allover shapes of the Tulip and Moroc-n-Roll stencils would create a nice effect. 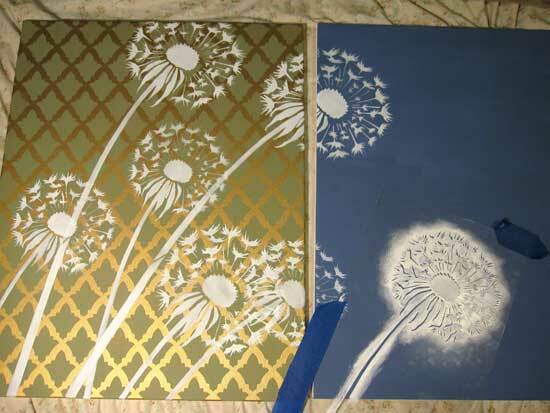 I chose to stencil the Dandelions in FolkArt Wicker White so that they popped against the background. I purposefully placed the canvases about an inch apart and taped the stencil down so that it went from one canvas to the next. I wanted to place each canvas a couple of inches apart but didn’t want the dandelions to look elongated once the art was up on the wall. When it comes to composition, I wanted to have the bulk of the Dandelions on the left side of the triptych, flowing over into the middle with only the seeds floating on the final canvas. A tip about creating an aesthetic composition, is to have most of the weight not only on one side of the triptec but also towards the bottom. It also breaks up the composition nicely to have a dandelion only partially showing at the top. Also, don’t be scared to overlap one flower stencil over anther to create a bit more dimension. After laying all three of my canvases next to each other, I felt the center one needed a touch of gold to tie in the gold from the other two. I decided to go for three thin stripes because my sheets have a striped pattern. Again, love the way I can really customize my wall art so that it ties in all the colors and design elements of my room! To make the stripes, simply take your blue painters tape and create three thin stripes (I did it by eye, but you can use a ruler for some assistance). 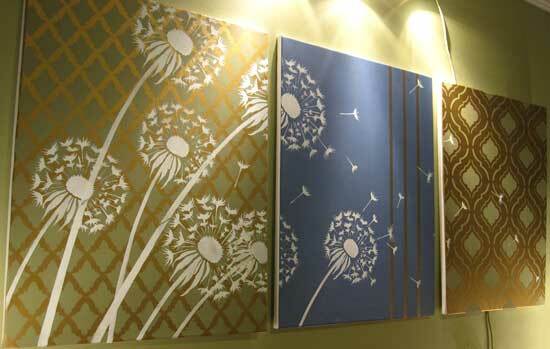 The Dandelion seed stencils were perfect for my triptych because they floated so beautiful from one canvas to the next. I like the affect of having some seeds looking as if they were just coming out of the dandelion, and others well on their way. I really wanted there to be a very organic and flowing element to the Dandelions in contrast to the very stagnant and predictable background. I love the way the Dandelion stencil flowers captured the feeling of motion and flow so perfectly. The idea with the floating seeds was to use a nice variety of shapes and sizes and place them in varying directions so it really looked like the wind was blowing them around. The floating seeds provided for free with the Dandelion stencil were so great because they are in a variety of shapes and sizes! Thanks to my roomie Darin, I was able to get some spot lights above the canvases (which he so graciously hung up for me) Thanks Darin!!! This customer photo was submitted by Leslie. 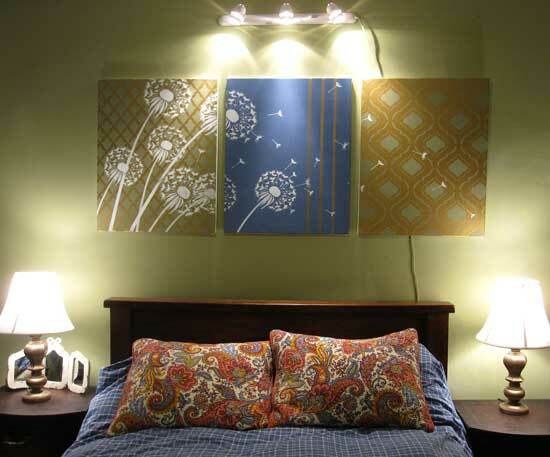 She definitely customized her Zinnia Flower Stencil wall art to tie in all of the colors in her bedroom. It looks so professional! Great job Leslie! 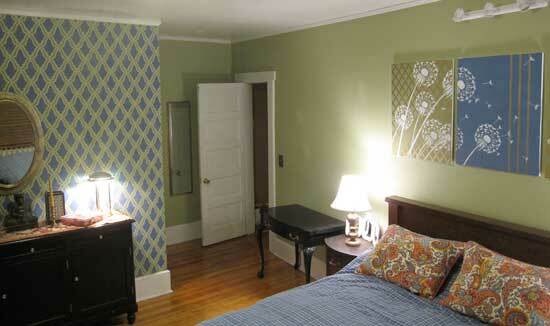 As you can see, Leslie used the Medium, Small and extra Small Zinnia Wall Art Stencil. She clearly had a hunch for good composition. 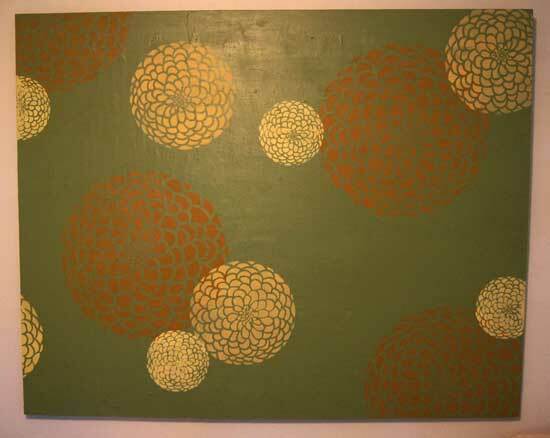 See how she overlapped stencils and wasn’t afraid to have stencils going off the canvas? Also, after speaking to her, she informed me that the canvas she used was recyled and customized to fit her bedroom this time around! 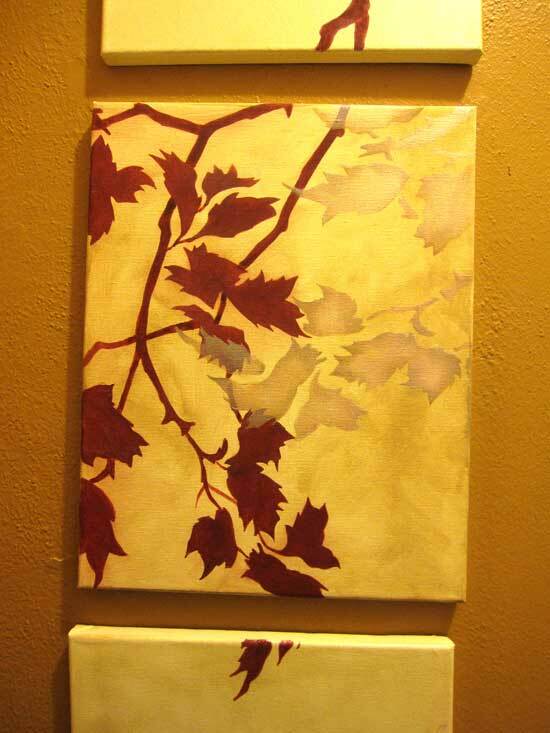 I used the Sycamore Weeping Branch stencil for this project in my hallway. The project actually started out was six small canvases that I stenciled the Sycamore Reaching Branch on. 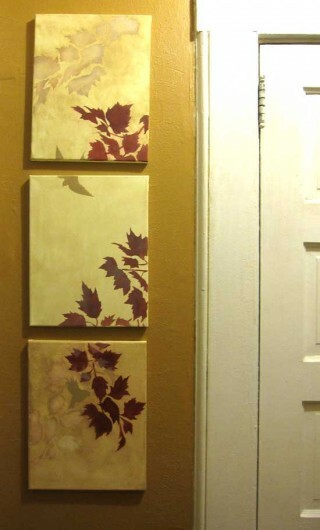 Then I separated the left three canvases from the right three and hung them like that in my sad looking hallway. This stencil project was sooo much fun and was done so quickly! I highly recommend it to anyone who is looking to compliment their feature wall or isn’t allowed to paint their wall (this includes a lot of renters). Trust me, it fast, easy and so much fun!